4D Technologies, a leading developer of innovative content delivery and in-application support tools, is pleased to announce that eight members of its CADLearning content development team will be presenting product sessions and hands-on labs at Autodesk University Las Vegas (AU Las Vegas), the world’s largest gathering of Autodesk users. 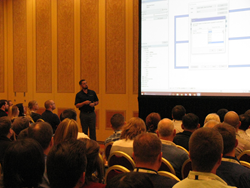 With eight speakers presenting eighteen sessions, 4D is sending more speakers to AU Las Vegas than any other Autodesk Authorized Publisher, further cementing its position as the leading creator of Autodesk learning content. AE122846 – Drones, Cameras, and Fusion 360! Oh, Maya! AS123243 – 30 Revit Productivity Enhancements You've Missed! 4D Technologies is transforming the way the world learns. Our experienced team of instructional design professionals are creating the next generation of solutions for the efficient consumption of knowledge and skill development. Using highly intuitive and adaptable content portals and in-application performance support tools, 4D Technologies is revolutionizing corporate education and technical support with proven solutions that maximize content retention, productivity and overall performance. To see our technology in action, visit http://www.CADLearning.com.